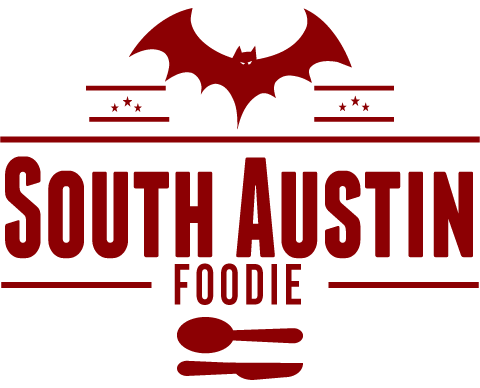 South Austin Foodie: A BBQ Trip Like No Other! A BBQ Trip Like No Other! February 16, 2013 is a date that will forever be marked as a favorite in the annals of my food journeys. It was on this day that I drove 197 miles and went to seven (yes, seven!) central Texas barbeque establishments all in one day. Why would anyone be possessed to go to seven spots in one day, you might ask? All in the name of culinary education. You see my friend Farmstress Maggie of From Maggie's Farm volunteered to write the "BBQ Outside of Austin" post for the Austin Food Blogger Alliance 2013 City Guide (you can read Maggie's post here), so there were some spots she needed to hit up to research her post. She asked a bunch of us if anyone wanted to go road trippin', she contacted the establishments ahead of time to make sure they were okay with food bloggers coming in and taking pictures of their places (some places got back to her, some didn't; more on customer service as the journey unfolds), she sketched out an itinerary, and off we went on the Great BBQ Road Ramble 2013 as she aptly named it! At each place we went, we tried to get brisket, sausage and pork ribs for equal comparisons, and beans, potato salad and cole slaw as well. Needless to say, there were some hits, and some misses. And as we discovered, there's good barbeque, and then there's GREAT barbeque. 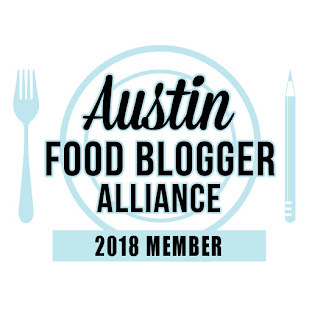 Our first four stops were places north east of Austin, and included Farmstress Maggie, her husband, Farmer Tom, and one of our other blogger friends, Epicuriosities. Our 10 am meet-up spot was at Louie Mueller in Taylor, which has been in operation in that building since 1959. It's currently run by Wayne Mueller, grandson of the founder, and he couldn't have been nicer and more welcoming. 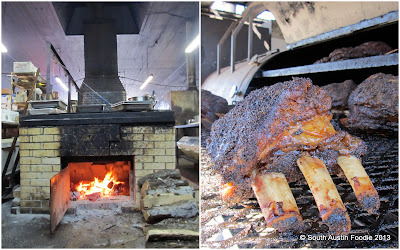 He told us about the history of the building, showered us with different meats, and took us on a tour of his pits, where they use post oak to smoke. I believe he said the building used to be a textile mill, and just has a great old feel to it. Can you see the bulletin board behind Wayne in the picture below? So many of the papers tacked to it are brown-tinged from years of smoke exposure. Just part of the great character of the building! Oh, and those meats? They were absolutely FINE! Starting with the tray on the left, in the upper left corner and going clockwise we have baby back ribs, sausage, turkey, and the brontosaurus beef rib. On the right, spare ribs, jalapeno sausage, and brisket; missing from the picture is the pork tenderloin Wayne brought later. I love baby backs, and these were tender and flavorful; the sausage had a nice texture, and the casing was just right; the turkey was amazingly moist, as it seems that often smoked turkey/chicken get dried out, this was delicious; and while I am generally not a beef rib person, this one might just make a convert out of me! Nice crust, very tender. As we rolled through our day, Louie Mueller became the standard against what we compared the others to. The baby backs, beef rib, sausage and turkey particularly won our gold star of approval. Side note, exactly a week after we were there, fires flared in Mueller's pits. Unfortunately, the pit you see here was destroyed, and the restaurant was closed for several days. They do have a couple huge mobile smokers out back (where they were finishing the beef ribs when we were there) and they're back up and running. 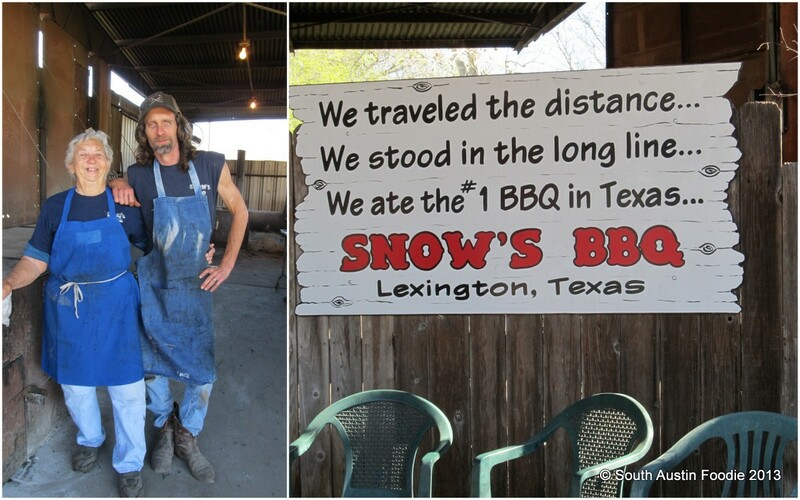 The next stop was Snow's BBQ in Lexington, which is about 45 minutes southeast from Taylor. Back in 2008, Texas Monthly magazine named Snow's the BEST barbeque in the state! And since they're only open on Saturdays, it's been a "get there REAL early" kind of deal or you'll miss out. Friends of mine -- whose food opinions I trust -- have proclaimed Snow's to be worthy of that title. And I can now concur: Snow's is the best brisket I have had. It's tender, it's flavorful, it has a gorgeous smoke ring.... I have always wanted to go, but this was my first trip, and surely not my last! Snow's had agreed to set some food aside for us so we wouldn't have to be there super early. We pulled in around noon, and found a group of motorcyclists finishing up their meal, and out for a gorgeous Saturday ride. Their sausage was fairly good, though it had been sliced a while earlier, same with the pork ribs. Good flavor, but it's the brisket that's killer. I did like their pinto beans too. Nice tender beans with some pork fat; no need to mess with a bunch of seasonings. The pit masters are Tootsie, and she's been doing this for years, and Hershey, who said he had had about two hours of sleep in the last 24. They were all a good, friendly bunch there! It's definitely worth the drive to Lexington, also one of the best deals at $10.95/lb for brisket. THAT brisket! Then it was off to Elgin, and the first stop was Meyer's. It's a good-sized place, with a whole separate room/counter showcasing all the different sausages they have available for sale. Just a little further bit down Hwy. 290 is Southside Market. This is another large establishment, and also one that is very commercial. And it was like a cattle call inside. You could either get in the line on the right or the left, and they both moved at the same slow pace. They do have a separate counter off to the left for to-go orders, but it was not functioning this particular afternoon, although several customers ahead of me in line were getting meats to go. And it seemed that every middle school or JV baseball team was there too; must have been a tournament nearby. So the place was teeming with people. The service at the counter was polite, but you could tell it was turn and burn. There was one primary guy who took the orders, and a couple of meat cutters on either side him whom he directed. I've heard their mutton is quite good, but we didn't have it this round. We got the 4-meat plate, with the brisket, pork ribs, sausage, and turkey. Sadly on this day, I didn't love their meats. The turkey was good, though not as moist as Louie Mueller's, and the sausage had a rather mushy consistency. Maggie and I really liked their cole slaw -- it was a vinegar-based, with celery and mustard seeds; I loved the twang it had, and it was probably my favorite slaw on the day. Maggie,Tom and I then headed down to Lockhart, where we were supposed to meet up with blogger friends Mad Betty, Mary Makes Dinner, plus their spouses. Since we were behind schedule, they went to Kreuz, and then we met them at Black's. This was my first time at Black's, and I would happily go back! Upon hearing we were food bloggers, the staff let us come back in the kitchen and gave us a tour of their pits. The staff were all super-friendly, and even though I know we were in their way for a few minutes when we were behind the counter, they didn't flinch, and acted like it was no trouble at all. True gentlemen! They also use post oak in their pits, and those lids over the pits weigh about 500 pounds each! Black's was the only other place that we had beef ribs, and this was a whopper of a rib! So at $11.98/lb, this rib came out to $20.25! But it had an outstanding crust on it, and a nice smoky flavor. Overall the meats this day at Black's were a bit on the greasy side, but the beef rib and brisket were winners. I also liked their pinto beans, but found the slaw and potato salad to be a touch sweet. Of the three Lockhart establishments we visited, Black's is homier, and the service was outstanding. Then we toddled our way over to Smitty's, just a few blocks away. The last time I was at Smitty's was in the heat of the summer. You remember that because one of their charms is seeing and feeling the hot fires stoking the pits as you walk in and stand in line. They've actually got a couple different counters open to get meat, and then you go into the main dining hall where the seating is, and where they sell the sides. Service here, particularly at the sides counter was less than welcoming, but it was getting on, later in the day. And if this helps anyone in the future, they only have spoons and knives, no forks. By this point my taste for BBQ was fading, and fortunately, Maggie, Tom, and I only got the bare minimum to sample. Decent flavor on the pork rib, and a real nice smoke ring on it; however the brisket seemed to have missed the ring distribution, and though it had a good crust, it was a drier piece of brisket. The sausage seemed to have a breakfast sausage flavor too it, and not that there's anything wrong with that, I just wasn't expecting it. Smitty's did have what turned out to be my favorite BBQ sauce; not to sweet, not too vinegary, not too thick, it was just right! The others had to get back to Austin for evening engagements, so at a little before 6:30 pm, Maggie, Tom and I entered Kreuz, where I hadn't been for years. Another "no forks" establishment, but also, no sauce too. Nothing to disguise the meat. Well, even though they are open until 8 pm, Kreuz was out of almost all the meats, and they were a touch snippy when asked what they DID have. We ended up with beef shoulder and some sausage, which is all they had left. They do a warm potato salad too, though we agreed it would probably be better when cooked up as a hash. Hate to say it, the beef shoulder was dry and grainy, and really coulda used some sauce. We were saddened to end on a lowish meat note, especially because our friends who went earlier in the afternoon RAVED about Kreuz's pork spare ribs, saying it was the best meat they ate all day. Important note to self: go to BBQ establishments earlier in the day. The original plan had been to go to Luling City Market after the Lockhart trio, but we discovered they close at 6pm, so we didn't make the trek down there. Fortunately, Kreuz did end on a high note: they have a Blue Bell ice cream counter, and rainbow sherbet was the perfect palate cleanser after all the day's meat. And while it DOES seem like we ate a lot, it really wasn't that bad, especially considering there was 45 minutes between Taylor and Lexington, and then also on to Elgin, and about an hour from Elgin to Lockhart, so there was time to digest. So folks, there you have it, the Great BBQ Road Ramble! A recap of my personal favorites on the day: Louie Mueller for baby backs, sausage, beef rib and turkey; Snow's for brisket and beans; Meyer also for sausage; Southside for cole slaw; Black's a close second on beef ribs,brisket, and beans; Smitty's for sauce; Kreuz..... for sherbet (gotta go back for the sparerib!). And again hats off to Wayne at Louie Mueller and the staff at Black's for their fantastic hospitality. It was quite the meat journey. Thank you again for joining me on that major trek. We sure had fun!